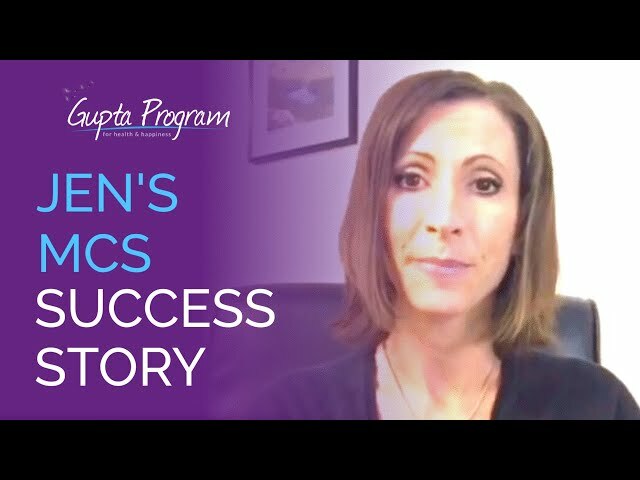 Hello and welcome to the Gupta Program Success Stories page. Here are some of the many wonderful stories we have collected over the years. I encourage you to revisit this page often to find inspiration and motivation from other Retrainers on your path to health and happiness. Dear Ashok, I received my copy of the Gupta programme. Within 2 days of starting the amygdala retraining, I began to have more energy. I had my best Christmas and New Year for 6 years and it was fantastic to be able to go round the sales with my sister and mum. Last year I was only able to travel to Yorkshire once to see my parents, and when I arrived it took me the week that I was there to recover enough to drive back. Last weekend I drove to their house on Friday, had a lovely day with them on Saturday, and came back to Cumbria on Sunday without feeling any ill effects. Everyone that knows me well has noticed how much I have improved. Having spent, and in many cases wasted, my savings, searching for the illusive ‘cure’ for M.E, I was drawn to your programme in the first place mainly because I felt that someone who was prepared to offer a money back guarantee must have faith in what he was offering. From the very first programme, I felt that the programme was going to work for me. It was as if you were talking directly to me. Everything you were saying was making sense, and your explanation of M.E fitted perfectly with my symptoms. You have become a part of the family. I watch one of your sessions every 2 or 3 times a week and use the audio CD every day. The book is also a very useful resource and its pages are covered in coloured highlighting pens – no way will you be getting my materials back. I wish I had heard of your programme earlier and I cannot express the depth of my gratitude to you; for the years you spent researching M.E, and for the wonderful programme that resulted from that research. Having witnessed my improvement, my brother-in-law and sister have both recommended the programme to friends/colleagues who have M.E. and I will spread the word too. I have been following the programme for a month now and am slowly learning how to live as a ‘well’ person again. It feels very strange at times, and I am not rushing things. My aim is to be able to return to some form of part-time work, but I will never return to teaching. I was a very driven person and I have been paying the price for the last six years. Now I appreciate that there is more to life, and I will make sure that I never get back on the hamster wheel that helped wreck my health. I just wanted to thank you for the seminar in London this weekend. I got so much out of it, you really are such an inspirational speaker. It has remotivated me and helped a few little last things to click into place. When I developed Chronic Fatigue Syndrome in May of 2012, I certainly fit the classic description. I had been chronically stressed for years: actually decades (I was 62 at the time, widowed, retired and living alone). I’d been a high school teacher, raised a large family, nursed my husband during his final illness, and then in “retirement” immersed myself as an over-achieving helper in increasingly stressful volunteer work that involved toxic relationships. But I felt that if I quit that work, I would lose my life purpose. Just at a crisis point, when I felt I couldn’t continue, I came down with a virus that was going around. For my friends and neighbors, it was ten days of headaches, low-grade fever and body aches, but for me it didn’t end. I tried pushing through for several months on the assumption that whatever the virus was, it would pass any day now. Meanwhile, I had a battery of blood tests done, which, as usual with CFS, turned up nothing. I was due to fly to Chicago (I live in Jamaica) that summer, and went ahead with those plans. While in Chicago, trying to keep up a normal schedule of visiting friends and relatives, I developed more symptoms. Everything was hurting; I had bladder and abdominal symptoms as well as severe headaches, severe fatigue, body aches, etc., etc. I did another battery of tests: again, nothing. By now I’d been sick for several months, and my friend’s words resonated. Soon after, I flew home. I’ve always been an independent, self-starting person, so it was hard, but I asked neighbors for help and cut back drastically on my activities. I was mystified and demoralized, but I began to face the reality that I would have to back off dramatically from my previous commitments and activities, at least for a while. Taking this new approach of actually taking care of myself, I began to relax. I remember thinking, well, if this is all the energy I have, what can I do to make the best of it? I started studying Spanish and Photoshop online and in books and allowed myself to stop feeling guilty about letting go of my responsibilities. I even started writing a novel, an activity I hugely enjoyed. And lo and behold, I gradually started getting better. For the next year and a half, I had near-normal energy about three-quarters of the time. So . . . I went back to my former roles and responsibilities. It never occurred to me that the one-quarter of the time that I had the old, familiar symptoms coincided with the times when I took on the most responsibilities and fell back into old, stressful behavior patterns. In late November, my daughter had a baby and needed help with what fortunately turned out to be minor complications. I flew to New York to help her and within a week, I was very sick. Ignoring my symptoms (again!! ), I continued on to Chicago and helped my sister host a big family Christmas. By the time I got home, I was in full-blown crash, worse than ever before. Now I panicked. I developed intense insomnia – didn’t sleep for days – and was prescribed a benzodiazepine drug. I started researching CFS with a sense of fear and desperation. I went the rounds of learning about exercise intolerance, POTS (which I self-diagnosed myself having), and began a slow, graduated exercise program. I found some researchers who were doing antiviral treatments and started an antiviral course. I learned about the mitochondria theory and began taking bunches of supplements. You name it, I did it. I was doing cognitive behavioral therapy with a wonderful woman, who pointed out to me that obsessively doing research online was not the same thing as resting, but I found it hard to stop. Finally, I found an optimistic story about recovery from CFS online, and since I was determined to get better, I began following that website, joining their online support group. I learned about pacing and created elaborate plans and worksheets to record and plan my activity levels, continuing to do a bare minimum of exercise: walking for five to eight minutes at a time, once or twice a day, and continuing the weight-bearing leg-lifts I’ve done for years to prevent arthritis pain in my knees (these latter were done lying down and I seemed to tolerate them a couple of times a week). I continued writing my novel and working on photographs, both in a semi-prone position. What was my level of functioning during this time? I rather optimistically told myself I was at around 40-50% of normal. But realistically, I was rarely on my feet for ten minutes. I spent my days lying on my couch. I sat on a stool to fix my meals. From a very active, intense person, I’d basically become bedridden and housebound. The following summer, I flew to Chicago to stay for several months and try to get medical help. I was concerned about my ongoing sleep problems and dependency on habit-forming drugs, so I saw sleep professionals and tried some of everything else with little success. I went to an integrative medicine doctor for guidance about CFS. She gave me some reading, prescribed some supplements, and suggested I go to a meditation teacher and begin a regular practice and recommended I try acupuncture. The acupuncture was very relaxing; it required me to lie still, eyes closed for up to an hour in a nice, quiet place. And the acupuncturist was also encouraging about the possibility of recovery. But it did not noticeably help me. However, starting a regular meditation practice (in my case, I started with TM as that’s what the doctor had suggested) had the effect of calming me down. I’ve maintained that practice ever since, though now I do it sitting, whereas as back then I adapted it by reclining while meditating. And then, in September, someone in the CFS online support group posted a link to an online lecture series, and I discovered Ashok Gupta’s Amygdala Retraining program. It resonated right away. I had used John Sarno’s mind retraining techniques decades earlier to cure severe back problems, so the amygdala hypothesis made sense to me. I started the program right away. I took Ashok’s advice and quit all my other research. I also quit participating in the online support group. This was a relief. 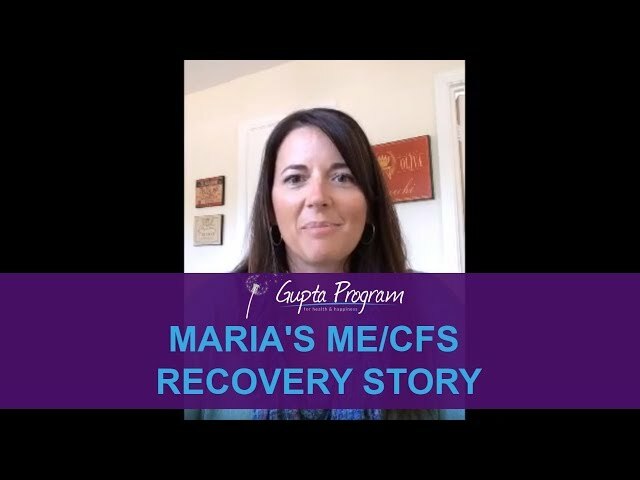 The group had begun to feel like a “pity party,” or at best like “how to live with CFS,” rather than something that anticipated recovery. Many people simply used it to report balefully on their symptoms and how bad they felt. This was discouraging. I wanted to recover and was willing to do whatever it took. I focused completely and solely on ART. I did twenty minutes of meditation in the morning before breakfast, another twenty before dinner, and usually another (often Soften and Flow or Surrender) sometime in the middle of the day when I needed a good rest. After my morning meditation, I did four rounds of ART using the mind map. After the first month or so, I didn’t use the physical map, but walked through the steps as if I was using it. I did four because I couldn’t come up with a fifth thought to retrain. I think I spent maybe a minute or minute and a half on each round, so this did not take long. However, I found it quite powerful, especially as I learned to speak to my “inner child” and felt the visualizations more fully. During the day, I did brief, often silent “stops” when I noticed negative thoughts (I’m sure I often did not notice them!). I also did the worksheets for the New Groove technique, and went back to those frequently to remind myself about my particular issues and change my thinking, using them in my silent “stops.” I used the Accelerator frequently in the early evening on my sleep difficulties. Most days, I did a gentle, 15-20 minute yoga routine developed for people with CFS and related issues that I found online. I did not do this before breakfast; midday suited me better. In addition to the retraining, I also was diligent about continuing to pace myself. I would notice how long I could do a specific activity before I became exhausted. While I could read and use the computer for longer periods of time, I found that engaging in conversation really tired me out. I went from ten to twenty and finally thirty minutes of tolerance of conversation – more if it was an uplifting conversation, less if it was stressful in any way. I also learned to stand up for what I needed with friends and family. If a conversation was stressful, I would politely say I had to get off the phone. If the conversation was in person, I would say I’m sorry, but I’m really tired and I need to rest for a while, could we continue this later? Going out of my house was another time-limited activity. Early on in my pacing awareness, I could go out (in a car and to somewhere I could sit) for about an hour. That gradually increased (with ups and downs) to about two or a little more. Most of my day, I was lying propped up on my couch. And let me repeat: I DID MY BEST AND LEFT THE REST. I did not beat myself up if I forgot to do something or didn’t feel up to it that day (though I did meditate and do ART daily). I adapted the program to suit me without feeling that I was “cheating.” I looked forward to the webinars and a few times had transformational insights from doing the guided meditations in them. I then used these insights to re-craft my retraining dialog with myself. As I did the retraining, all of my physical and social limits gradually increased. In November, I plateaued at about 80 – 90% of energy and health. The plateau was discouraging: I, of course, wanted to see constant progress and complete recovery. But I knew that no process in nature moves in a straight line. I took seriously my six-month commitment to the program and kept at the retraining even though nothing seemed to be happening. (After all, when you put a pot of water on the stove burner, nothing seems to be happening for quite a long time!) November passed. December passed. No change. Then in January, progress began again. A few weeks into February I gradually realized that I’d gone several weeks with no symptoms! I’d reached 100%! I still tired easily, and it took me some time to understand and accept how deconditioned my body had become from years of inactivity. I learned to be patient with reconditioning myself. I had gotten off the habit-forming sleeping pills by gradual weaning under the instructions of a sleep psychologist, and was using herbs, melatonin and an occasional prescribed (non-habit-forming) sleep aid, but was sleeping well with that help. So I could gradually increase my physical activity and begin to get back into shape, continuing and enhancing my weight routine, walking, riding a stationary bike and swimming. And – wonder of wonders – I could go out, go shopping, talk to people for long periods of time and still no symptoms! My challenge over the next several months was twofold: first, to learn how to reorganize my life and create new goals for myself while making sure to do my one-year of taking it easy and enjoying life as suggested by Ashok. And second, using the techniques as needed to deal with fears that cropped up about whether my recovery would be permanent. 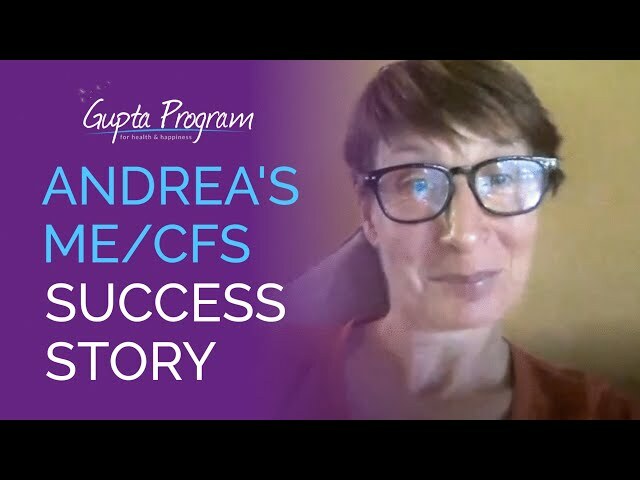 Anytime I felt tired, I had a tendency to worry, and I knew I still had some learning to do in order to avoid falling back into the patterns that made me vulnerable to CFS in the first place. In March or April, I began working with a coach on these things, using amygdala retraining tools and EFT, and this was extremely helpful. For example, I discovered that I got more tired from emotional triggers than from physical ones – something I’d been misinterpreting as I increased my exercise. I also repeated the webinar series for the additional information and ongoing support it provided. Over the next year or two, I occasionally watched one or another of the webinars saved on my laptop to give myself a reminder or reinforcement. I also watched the Meaning of Life videos, and continued to use the New Groove worksheets on specific things that I found stressful (in my case worries about sleep and tension related to travel and family issues). As I write this, I am 68 years old and have more energy than I did ten years ago. The novel I wrote while I was sick is going to be published this year (it has nothing to do with CFS), which is very exciting, requires ongoing work with the publisher and will require travel for promotion. I travel three or four times a year, thoroughly enjoy my grandchildren, exercise daily and have created a new life that, while different from the one I had before my illness, is deeply meaningful and gratifying to me. It has been an amazing process, and I have to say that I am grateful for having gone through it, as difficult as it was. * Don’t be perfectionist about the program. DO YOUR BEST AND LEAVE THE REST. You will gradually learn what works for you; you don’t need to do every technique exactly as presented. Adapt the program to your needs. * ACCEPT where you are right now; you are okay. You are in a process that will take an unpredictable course and an unpredictable amount of time, but it will get you back to full health. Try not to feel sorry for yourself; you will get better and you will learn so much about yourself in the process that you will be better than you were before you got sick. * HAVE CONFIDENCE in the process. It has worked for many people, including me. Have patience. It will work for you. * Be KIND to yourself. Take care of yourself with as much LOVE as you would give your partner or your child. You are worthy of it. Here goes, I’ll try to give you the full story! My first experience of ME/CFS symptoms were when I was pregnant about 44 years ago. I could hardly crawl out of my bed during the early months. This settled down and I became a fully functioning expectant mum at around the 4th month. I hadn’t a clue what had happened and neither had my GP. Now I recognise it as ME/CFS. Previously I had tonsillitis followed immediately by cystitis both of which my GP treated with penicillin. So followed an allergic reaction to that. That was the start of my ups and downs health-wise over the next few decades. I had major surgery and repeated minor surgery, mainly for gynaecological troubles. But in between times I was pretty well able to live normally as a single parent and as a teacher. I also had a few traumatic experiences, including the death of my older son. After many years of working all hours, never being able to relax, such were the pressures I felt were on me, I became ill repeatedly with what I thought was flu. Finally in November 2000 I conked out completely and was unable to function due to the severity of the ME/CFS symptoms. My GP diagnosed it correctly and told me I would never recover completely but may improve slightly after a time. We hunted for a treatment which would help me, but any medications we tried (‘we’ being my GP and myself) increased the levels of all the symptoms. So I tried to live inside my not very comfortable zone. I existed. A friend gave me some deep relaxation CDs, which did help. So when I found the Gupta programme in 2010 I leapt at it (figuratively speaking, obviously.) The whole theory made so much sense to me as for years before I conked out I’d had adrenaline withdrawal symptoms at the beginning of holidays. I knew I’d been living off adrenaline but couldn’t see how to stop…until Gupta. Within a couple of weeks I knew I would get better. Within a year I thought I was fully well, apart from not sleeping. I used the Accelerator on that, and all’s been well since. Since then I have continued to get even better so I can’t have been 100% when I thought I was! I am still improving steadily. Recently I realised that I am now able to listen to music, and smells and various chemicals which were a no go zone are now OK. I can read today’s newspaper if I want to without reacting to the fresh ink! Today I woke up, went through my daily routine: 20 minutes meditation, shower, exercises, breakfast; an hour’s dog walking; a 10 minute sit down with peppermint tea and a book; drive into town to visit my 87 year old neighbour in a care home; back home for lunch; soften and flow; an hour’s dog walk followed by delivering Christmas cards; a 10 minute sit down. Then onto this! There are variations in this, sometimes I do a lot of housework or gardening, but the gist is there. I still have mild fibromyalgia, but can live with it as I consider the pain is only a message to my brain that there’s something amiss. As I already know what’s amiss I just tell my brain ‘not to bother, it’s an old problem and not worth reacting to.’ That usually eases the pain to a level I can ignore, or even better the pain goes. I use the various techniques as and when I need them. Today I turned what would previously have been a recurring negative thought about someone’s attitude to me from yesterday into something which made me laugh. She’s called Agnes, and I remembered the welsh call of Uggy Uggy Uggy, Oi Oi Oi etc and changed it to Aggy Aggy Aggy Oi Oi Oi. This stopped me from feeling the need to phone her and puy my point of view to her, which wouldn’t have helped at all. So, I now feel at least 10 years younger than my 69, and probably 40 years younger than when I was so ill. The friends I lost are well gone, who needs them? I have some lovely friends and keep meeting and making more. I am calmer than I ever was, serene in fact, and with the techniques to prevent slipping back into damaging ways. I will always thank Ashok for not only giving me my life back, but for a new and better life. If I can give a teeny weeny bit back by helping others I am glad. I believed I could fly. My recovery story. I was already sick for years. I had adjusted my complete life to this new disabling fatigue. I couldn’t walk more than a few steps. Everywhere in the house were chairs and stools, I went from one to another. Sitting. But tired as a dog anyway and feeling sick all the time, unless I did absolutely nothing. Outside I needed a wheelchair and a scooter mobile, I needed someone to do my shopping and someone to clean the house and someone to help me in the garden. I became so dependent on other people. Then someone told me about Ashok. I watched the free sessions on Youtube and that was difficult because my mind couldn’t handle so much words, so I had to cut it into pieces. But whilst listening there grew a joy inside of me. This man knew what he was talking about. He mentioned things I couldn’t explain to anyone. He described how I felt and I didn’t even talked to him. And so I began, step by step, day by day. If I couldn’t believe with my heart what Ashok was telling, I just pretended to believe it. I acted as if my life depended on it. I talked to myself and was as convincing as I could possibly be. I believed Ashok more and more, I got used to believe in my own pep talks and encouraging words. “You can do it!”, I told myself day in and day out. And I could. I became my own inspiration next to Ashok who was the greatest inspiration of all. After a few weeks, I got on my bike and I went for a little, little block around the building. And I told people: “I can cycle again!” “How much?”, they asked. “For half an hour ?”(little did they know…). “No, just around the building: Two minutes, but… this is the beginning.This is my new beginning”! And it was. I visualised myself walking, cycling, riding on horseback, laughing, enjoying life again. And it happened. It worked. Six months later, I stepped on a plane to Portugal for the holiday abroad I had promised to my youngest daughter. A promise I could not redeem in years. I was a bit optimistic. It was a little bit too soon. But we went. I did it! And I wrote in the sand on the beach with a stick: Hannie was here! And I posted it on Facebook. I never became this super-energetic person I would like to be. But I cán cycle for hours if I have to. I can travel by train. I can do my own shopping and enjoy life with my friends. I can dance and decorate my own home. Half a year ago I moved house. I had a little setback, but….. no biggie. I did this thing I thought I could never handle. I’m living a miracle. My miracle. I must add that I did it together with my Saviour Jesus. I prayed for every session. Some things I could not combine with my beliefs and that was no problem. I just used the things that worked for me and that felt okay. You can adjust it easily to what you can handle. And if I could do it, you can! Believe it! Fake that you believe it, if your heart tells you otherwise in the beginning. What have you got to lose? Stop believing in your own theories about the cause of your illness.Give the theory of Ashok a chance. Don’t put your heels in the sand and reject this chance to become healthy again. I saw those people around me. I told them about Ashok. But they wanted so much to be right and they wanted so much to hold on to what they had become used believing in, and now, they still believe they are right and that there is this unknown cause of ME and they are still waiting for a medicine to appear. They were too afraid to let go of their own opinions and embrace the things Ashok tells us. What a pity. Because the remedy is already here! Embrace it. Go for it! 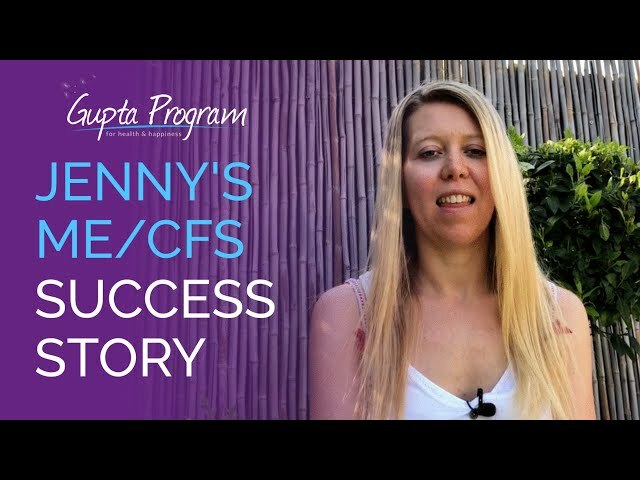 Your method is really groundbreaking, it’s an innovative approach to dealing with CFS that truly empowered a desperate individual with CFS like I was. Thanks to your Amygdala retraining program I have come to realize the fact that I have been dealing with ADHD and Social anxiety for many, many years, even decades. After 15 years with CFS, I have finally achieved to heal and balance my everyday energy. 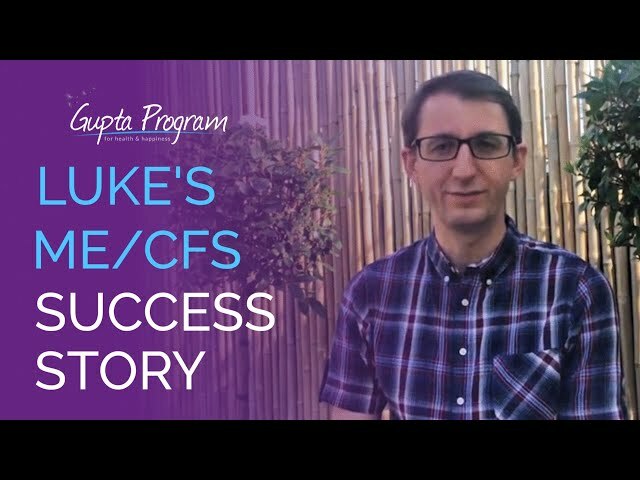 In that line of thought, I have to be truly and deeply thankful to have developed the CFS which in turn had led me to Ashok’s Healing Program. I highly recommend Ashok Gupta’s Amygdala Retraining Program to anyone who is struggling with CFS, Fibromyalgia or a low energy phase because it definitely tackles those subconscious and unconscious issues and thoughts that keep us in the negative and overactive loop, draining us without relief. I wanted to thank you as your program has absolutely changed my life! Since I was 14, I have had glandular fever and throat infections, low immunity and have suffered constantly with low energy. Despite this, I have lived a very normal life – I have a great social life, great relationships, I run a recruitment agency, travel regularly and generally enjoy life, although I regularly wondered why I couldn’t keep up with my peers. I have found that over the last three years, I tend to be so busy that I burn out and my body eventually says no and I tend to get bouts of CFS. These had only lasted a few days to two weeks before, but most recently, I was out of work for about 10 weeks, and this was the worst I have ever had CFS. In my research and in my recovery, I had realised that my nervous system is constantly on high alert and I operate very frequently in flight or fight mode – because I enjoy being busy and relish in the stress of my life, I didn’t necessarily realise this was a bad thing, but now know it obviously is! Reading about the amygdala, I decided to google “retrain your amygdala” and came across the program. The moment I received the pack, I started reading and instantly began my recovery. As I did the technique for the first time, I knew I had now the knowledge and tools to recover fully and, with meditation and the program, I got better very very quickly and went from house bound back to running my business and normal life within a couple of weeks. Given that I had spent 10 distressed weeks at home, trying every alternative remedy under the sun and in complete despair, this really was life changing. That was in late August, and since then I have been living life as normal – in fact better than normal, because I am now aware of when my body is in the “danger zone” of high alert and I can calm and nourish my nervous system with meditation, yoga and the program. Since my recovery in August, I have travelled to New York, to Sri Lanka, attended many social events, am working full time again (in a much more balanced way, I will add!) and have really been operating at 110% in comparison to how I lived before. Thank you so much for dedicating your career to this – I am an absolute success story. Given my belief in the good that the program can do, I would love to find out more about becoming a coach. I believe I have put my name down, and I would love to study NLP and potentially get involved in future. Hi, my name is Nancy. I completed the Gupta Program two years ago. I had suffered from multiple chemical sensitivities and electrical sensitivities. I have a lot of fatigue. And a friend of mine had great success with the Gupta Programme, and she highly, highly recommended it. So, I tried it. I was very diligent and committed, and I found that I grew tremendously in the program. I had done lots of yoga, lots of therapy, lots of other modalities, but nothing really helped to transform myself like the Gupta Programme did. Hello. My name’s Luke and I first became unwell after a virus on holiday. I came home and I never fully recovered. In fact, I ground to a halt and it was after a few years that a friend who fully recovered recommended this course, and so I tried it. It started to give me my life back. I started to be able to do things around the house and gave me the tools to manage my illness. Hi, my name’s Jen D’Alvarez, and today I’m healthy and happy thanks to the Gupta Program. To give you a little idea of my background and my story, in 2005, I had just completed graduate school and was slated to start a new job, which I was really excited about. Obviously a little nervous, but I was definitely up for the challenge. However, once I started that job, I was working in a building where there was a lot of construction going on, a lot of chemicals, and I started experiencing really severe brain fog. I had a hard time remembering things, thinking, concentrating, you name it. My tongue was swelling up every day. I had chronic sinus infections, horrible skin rashes, and the symptoms just kept getting worse. I eventually figured out it was something in the building making me sick. I didn’t know what it was. I had always been healthy, so this was a shock to me. I started working from home for the next five months, and only going into the office for meetings, but those symptoms persisted. My employer basically talked me into quitting my job, because I was too sick to work. For the next eight months, I was essentially home-bound, I was just too sick to go anywhere. I spent a ton of time and money on treatments, and nothing really helped. I was fortunate to be recruited by another employer eight months later, who was willing to work with my needs and accommodate me. I had an office with access to fresh air, people didn’t wear perfume around me, there was no air freshener in the building. I could wear my charcoal scarf whenever I needed to, but I did stay sick for eight years. It was really tough. I couldn’t go to movie theaters, I couldn’t go to restaurants unless they hadn’t sprayed pesticides in a while. I couldn’t go to the mall. Clothing stores were out of the question, shoe stores, all of that stuff. It was a very, very tough life, and very limiting. I did spend a ton of money over those eight years, and I tried every treatment imaginable, and nothing really worked. I had essentially resigned myself to being sick for the rest of my life, which was really sad, because I was only 27 when I first got sick. However, a friend who also had multiple chemical sensitivity told me about this Gupta program that was working really well for her. I was understandably really skeptical at first, because I had tried anything and everything and nothing worked, but I figured, “Why not give it a shot?” I did what Gupta recommends, which is to give it 100% of your effort and your time, and to really believe in the program, not talk to other people about it, because you can’t have their doubts instilled in your mind if you want it to work. I meditated every morning and every night. I watched one to two DVDs a week. I employed the stop technique probably hundreds of times a day at first, until it became second nature. Within a month, I was about 40% better. Within five months, I would say about 80% better, and after a year, 100% well. That was the end of 2012. We are at the end of 2016, and so it’s been four years that I’ve had my life back and my health back. Hi, I’m Maria, and I am 44 years old. I got chronic fatigue syndrome when I was 28 years old. It started with a typical flu-like illness, the Migraine, vertigo, nausea, stomach pains. And I’d had it for about seven to 10 days before I decided that I should go to the hospital, because it didn’t seem to be getting any better. It really seemed to be getting a lot worse. And so, my mom took me down to the hospital, and they checked everything out, and their diagnosis was, “You’re just having a really bad flu, you need to let it run its course and everything should be fine in a couple weeks,” but I was pretty concerned at the time, because I was supposed to start a masters program in physical therapy in a couple weeks. And I knew that it was going to be a very intensive program, and I needed all the energy I could get. So, the idea of coming in not a 100%, made me a little bit nervous, but I waited it out, and it never got back to normal ever again after that, and even though I did start school, and it was about 40 hours a week in class, and then a good five to six hours more a day, of studying after class. But in the 27 month program, I really did struggle a lot with chronic illness. I seem to go through a lot of phases where things would start to get a little bit better, and then I thought, “Maybe this is getting better finally,” and then I would get another illness. And it could be something like the flu, or a cold, or basic exhaustion, just … I remember it was the feeling that my arms weighed … I would tell people it feels like my arms weighed a 100 pounds. I feel like lifting my arm is the most difficult thing I could possibly do. I had episodes with Migraines. There was a point in school where I had a Migraine for 77 days, and I went to the Migraine center at the school that I went to, and we tried about six different medications, nothing that really worked. The last one really just put me to sleep most of the time, which was tough during class. And eventually, I think, the Migraines just went away. But it wasn’t because of anything that I was taking. It was a lot of nausea, a lot of anxiety, I noticed that I was often sicker after school, or on weekends, or on vacations I would get a really bad illness. It was almost as if I was using all my adrenalin to get through the day, or through a week, or through a semester. And then, when I would relax, everything would fall apart. My body would finally let go, and I would end up spending days to weeks on the bathroom floor. It was a very challenging period of my life, and I did receive a number of different diagnoses while I was in school. Different physicians, or practitioners had different ideas for me. In the course of those 27 months, I did go to student health 44 time. And partly, suggestions from them, and partly suggestions from other people outside the school, I tried a number of different medications, a number of different diets, which I’m sure a lot of people out there have tried. I did a Candida diet, an all raw food diet, I did an all cooked food diet, the no flour, no sugar, no caffeine, no alcohol, which really is … That’s a beneficial one, but it didn’t cure me by any means. I think it was probably, that was just a smart thing to do. And actually, in that timeframe, when I was going to school, those were some of the things that I really relied on to get me through the day. Caffeine and sugar were my two go-to things to just get me through. And so, I think when I did have those breaks, it was why my body fell apart, because I was using these artificial things to get me through, and it was putting me in a worse situation after. A lot of supplements that I tried during that timeframe, but really, nothing was helping me for more than one to two weeks at a time. And I remember one time I went in to student health, and the nurse practitioner had suggested that maybe I had Chronic Fatigue Syndrome. And this was in the late 90s, and I did a little bit of research on it, and everything that I could find at the time was really disheartening. There was no cure, there was no test to find out if I really had it for sure. There was nothing I could about it, even if I did have it. I noticed that there was a lot of public ridicule, a lot of controversy about the illness. And I just didn’t want it to be Chronic Fatigue Syndrome. I think the idea of it was, “It can’t be this, and what I have is so much more severe than Chronic Fatigue. It must be something more horrible than this, it must be a tumor,” which I also had them look for. I was sure I had a brain tumor. But of course it was not that. And so, I really, I put that idea on the back burner, and continued to pursue the other things that I thought it might be, that seemed much more scary. I managed to make it through school, and graduated. And then after school I got my first job, and after three weeks, I had another setback, another flu-like illness, and it was so severe that this caused me to become bedbound for 10 years. And it was a real exacerbation of my illness, and I was unable to ever come back and work at that job again. So, at that point, I became largely home bound, moved back in with my parents, and they took care of me full-time. I was unable to have a job, I was unable to get out of bed most days, except for the necessary things. It was extraordinarily difficult. I was completely disabled at that point, for about 10 years, and I tried Chinese herbs, I tried acupuncture, I tried a daily intravenous therapy of vitamins, different supplements that they thought would help. More diets, physical therapy, psychotherapy. I did a clinical trial of some drugs. I tried everything, and there were all these things that everyone else seemed to be responding to, and I think I was just that one person, and I was really convinced I was that one person that nothing ever works for. So, at this point, my doctor told me about an international conference for Chronic Fatigue Syndrome in Reno, and we decided that we would go to that. But I got so sick that I didn’t make it through. And he made it through, and he met Ashok, and when he came home, my doctor told me about the treatment that he had learned about by speaking with Ashok. And I did some research online, and with my science background, reading, and seeing what he had on his website, for the first time I thought, “This makes perfect sense. This is absolutely going to work.” And even though I still had those fears of, “I’m going to be the only person this doesn’t work for,” I decided that I was going to give it the full six months to do it, and in those six months, I wouldn’t make any judgments, I wouldn’t evaluate my progress, I wouldn’t put any pressure on myself. But after six months, I noticed a huge improvement, and after a year, I thought, “I feel really great.” I felt like I was about 60 to 70% better, which was huge for me, and I know in the DVDs, Ashok had said, “Once you start feeling better, give yourself a year to live a normal life, do some things that make you happy.” And I did that, I spent a year really embracing the health that I had gotten back, and I had more gains to make. After that year, I was about 80 to 85% normal. And it was at that point that I actually started working again, and I worked three to four days a week, I was standing the whole time while I worked. That was part of my job, and I was able to then move into a managerial position a year later. And I’m happy to say that it’s now been about three and a half, four years. And my health is about 85/90% of my normal, which I would have taken on any given day. I live a normal life, I’m very active, I work, I raise kids, and without Ashok’s therapy, I wouldn’t have had any of this. I am truly grateful to Ashok and for the treatment that he developed. And if there is any tips I could give to you out there, that if you’re thinking about it, start the treatment when you are at a point in your life when you can dedicate yourself to fully doing this treatment. Be committed to it, give it a full six months, and really do it all the way. Do as much as you physically are able to do. Don’t do it halfway, because I think your result will also be half. If you want a 100% out of this, you need to give it a 100%. And do all of the exercises in the handbook, that was extremely helpful to me, and the more time and effort that I put into it, the more I got out of it. And seeing where my potential challenges were going to be, was one of my favorite things about the workbook. And so, when they came up, I actually knew how to deal with them. So, I have to say that, this really was the easiest treatment I did in 12 years. The other treatments that I did were … Sometimes they were painful, sometimes extremely difficult, A lot of side effects, or they took out a lot of joy in my life. Hello there. I would like to give you further feedback of retraining our amygdala and also doing the Meaning of Life Experiment. I’ve been suffering with fibromyalgia and chronic fatigue and Lyme disease for approximately 30 years. I cannot list all of the things that I have tried on my journey to get well. It’s been a full-time journey where 90% of my attention has been on just handling my body. I got married 10 years ago and my wife also got quite ill with interstitial cystitis and stomach problems and other things also. We learned of your amygdala retraining program about four months ago. I immediately started seeing changes, even though we’ve done everything in the world having to do with the mind, so we thought. It’s the brain! After doing your processes I have regained many abilities that I used to have. My wife is getting better a bit more slow than I but she is also quite determined. What I am surprised that it helped me with so much is my neck pain which I have suffered from for so long. I realize that I was resisting and causing a lot of the pain but I didn’t know how to handle it. Your program fixed that up for me doing the Accelerator fixed so much. Stop stop stop of course has done so much hope for me also. And then we get into The Meaning Of Life Experiment which is just amazing. We have suggested it to many many people and the ones that have done it report back with really amazing results also. It’s so simple and laid out so well we are all very happy. So now I am better, my wife is getting better, my father in law and mother-in-law are getting much better as are some of my friends. Anyway I wanted to give you a bit of an update because you are creating wonderful happy people over here in the United States, Nebraska, Florida and North Carolina. I honestly cannot thank you enough. So many miracles are happening in our life. It’s obvious that your goal in life is to help others and you deserve to know that you definitely are! Thank you thank you thank you. Dear Ashok. I’ve been meaning to write to you for a while to say THANK YOU so much for your fantastic programme. I discovered it about a year ago when I started suffering from severe headaches after a kitchen refurbishment. I have taken a while to write to you as I wanted to be 100% better before doing so. My headaches started after having a laminate floor laid in our house but they didn’t go away even after the smells and fumes had died down, in fact as time went on, I become sensitive to many other volatile organic compounds, candles, smoke, fires and even friends’ perfumes and it began to realise that I had some form of chemical sensitivity. I was at this time feeling negative about our house, our new kitchen and after two air analyses showing that we had high levels of volatile organic compounds and formaldehyde, I had trouble letting go of the feeling that the kitchen was a toxic space. For 3 months I suffered with headaches, dizziness, a bad taste in my mouth every time I went into the kitchen. The situation wasn’t helped by the two air experts telling me that I had probably developed a chemical sensitivity that wouldn’t just go away with time! What really disturbed me about my situation was that nobody understood what I was experiencing, how could they? No one reacts to these everyday chemicals and yet there I was reacting to everything. Trips to London resulted in my nose becoming congested, sneezing, head buzzing and headaches. At the time I couldn’t believe that this had happened to me, at that point I had trouble believing that the symptoms were caused by anything other than physical reactions that were irreversible. I was so desperate to get back to normal and a life without debilitating headaches that I took myself off to Thailand to a detox retreat, however, by this time my lips were also tingling and I had horrible sensation on my tongue. I recall the airport smelt so strongly of perfume as did the plane that I spent most of the 13 hour flight with a pain over my eye and horrible headache. I was frustrated – I felt so trapped in my own body and my anxiety was building. I spent a week at the detox resort and, despite everyone being so generous and caring, I came back and I was still reacting to the kitchen and other smells. I was beginning to panic, and the underlying fear that I had MCS and would have headaches forever, was debilitating. At this point, I ‘d read so many negative accounts of people’s lives and how they were affected by MCS that I really was at my lowest point. My doctor prescribed Diazepam – which for anyone that knows me, was such a huge deviation from who I am, I loathe taking pills (especially something so addictive and mood changing) and I have never suffered from anxiety or depression, but at this point I needed something! Fortunately, I only took it for a few days and whilst it made the headaches less painful, I knew I could only take it for a short period. This was when I discovered your programme. Your theory fitted my scenario perfectly, I read a few reviews plus watched the video of your explanation, e.g. being caught in the figure of eight loop, even though, at that stage, I was convinced it was too late for me. I also tested my cortisol levels, they were very high. I followed your advice and after a few months of meditating, doing the 7 step process, watching the webinars and finding Frances Goodall I was well on my way to recovering. Today I can tell you that I’m 100% better, after a few months already I’m almost taking it for granted, even though I was completely convinced this was a condition that was irreversible (and you were right, so many people put their negative experiences online but there isn’t much positive stuff out there! ), but here I am. I can wear perfumes, sit next to fires, even walk into newly decorated rooms and don’t have any reactions. I can walk around London in heavy traffic and no sneezing or headaches. Also, my sense of smell seems to have normalised and I can no longer smell detergents and people as I used to. It’s as if someone has turned down the volume for smell. To give you some idea of timescale: my reaction to the initial chemicals in the floor and kitchen happened at the end of Sept 16, I went on the detox week November, started the Gupta programme end of Dec and by Feb I could be in the kitchen without reacting and gradually all of the other reactions dissipated around June 17 and were totally gone by Nov 17. I used other modalities too, such as those taught by Frances Goodall (who was also integral in helping me), I got rid of all perfumed substances in my house for 3 months, spent a week on a Rosen intensive course and then the final thing that seemed to help convince me that I was healthy and wouldn’t react to smells was 3 sessions of hypnotherapy. Alongside all of this, I took supplements, Vitamin C, B vitamins and glutathione, drank lots of water ( I’m a nutritional therapist so was able to address that side of things). It did take a while though, and I did have a return of symptoms whenever I was stressed or unhappy, but by this time I was able to assure myself that it was just a temporary reaction. Today, I’m so well that looking back and reflecting, it was as if it happened to another person. Your programme really works and I hope by sharing my story that you can get some insights into helping others and knowing that another person has overcome her sensitivities. Today is the 6-month date since I began the Gupta Programme. It is the date that I taped on a drawing of a sunflower on my wall. Six months ago, I put that date up feeling like it was a very long way away—physically, mentally and emotionally, but I practiced, as Ashok teaches, to use that date not as a goal to “fix” myself, but as a way to let go—by reserving judgment until I arrived at that day on the wall. Today is that day—and I am recovered. I lived with CFS for thirteen years, riding the cycle of “remission and relapse.” I don’t want to go into the details of my illness or its onset, since I know how we folks can be before we begin retraining. We easily dismiss a success story if it isn’t exactly like our own experience, or if we think the person hasn’t had it “bad enough” or “long enough” to be counted as legitimately ill. This is one of the insidious parts of this condition—and healing from it means healing the way we see ourselves and the world around us. A year ago I went to a doctor after a severe relapse, I took with me a list of my symptoms (knowing I was going to have to “prove” myself). The list was a page long, single-spaced. Three months ago I looked at that list and crossed off 70% of the things on it. Today I looked at it again and crossed off the rest. Today I am 100% recovered, and building a new and happy life. I found that the DVDs helped me to recover from my symptoms, but the webinar helped me to learn how to build a long-term happy, healthy life. That is the key to staying well for me. The more positive I am the stronger I feel inside and out. The tools the Gupta Programme has given me are tools for a wonderful life, not just for being physically healthy, but for thriving. My journey with the program started when I realized two things: 1) I felt stuck in “fight or flight” response. (I call it, “fight, flight, fix or freeze”) I was very reactive, fearful, and always rehearsing for a fight. 2) I was outwardly positive, but inwardly very negative. I spoke in such a mean way to myself. I didn’t know how to get out of fight or flight, but I did start uncovering and re-writing the negative messages I had believed about myself. I practiced hearing my subconscious thoughts in a conscious way, understanding where they came from and that they were not true, then replacing them with more positive messages. One thing led to another (it was real trail of magical clues) and I discovered the Gupta Programme. When I saw the hypothesis, it immediately made sense to me. After thirteen years with CFS I was ready for things to change. I did the program as directed. I definitely resonated with the “accelerator” tool more than the seven-step process. This is because I knew that my negative messages came from deep patterns that had developed over time. I wanted to get to the source of the thoughts, not just the thoughts. I use the seven-step process for things that are more on the thought-level, like obsessive thinking about a person or a conflict or event. Just the “stop-stop-stop” and a breath and smile can shake me out of the past or future thinking and get me back into the present moment. I meditated two-to-three times day, and found the “soften and flow” invaluable. I also found that the positive visualizations what I call “the lemon exercise” helped a lot. It helped me to have positive imagery to focus on to replace the negative thinking. That gave me hope and I could feel it changing my inner sense of the world instantly. I revisited those positive visualizations several times during a day, and I am certain this had a huge impact during my first few months of recovery. Over the course of the six months, I was able to take myself down from taking 18 supplements a day and drinking special water to keep my blood-salt levels up (to prevent that dizziness we get). I was taking three times the supplements of some things just to get a small effect. I now take five very reasonable vitamins and herbs a day- normal things that any person would benefit from (D, C, Iron, Ashwaganda) that are for my long-term health. I drink regular water. I was also on a “methyl guard” supplement as one naturopath had convinced me that I had a genetic condition that could never be cured and I would have to be on the expensive supplement for the rest of my life. I felt dependent on it and terrified if I ever ran out. Today I don’t take that supplement. Regardless of my genetic profile (whatever it may be) I know that my wellness is well taken care of using the tools of the program and living in the new way I have learned. I also now sleep through the night—which is a miracle in itself. I haven’t done that since I was a child. The page-long list of my symptoms are on a permanent vacation, and I am confident that I can handle life without their cropping up. Two years ago, I got a guitar and started learning how to play. I have always loved to sing and I found that singing again helped me to relax my mind and feel my feelings. The Gupta Programme encourages us to do things that make us happy and to find distractions. I embraced music and last week I played my first open mic and sang two original songs that I wrote. I did that after going roller skating for two hours. I had bought myself a pair of roller skates for my birthday and decided that my way of getting physically fit (when I was ready) had to be something that made me really happy. I got myself a private lesson, and spent the afternoon rolling around the rink to disco on my iPod. I went straight from there to the open mic. This was more activity than I had had in a long time. The program teaches us to “be active at our edge” as we are getting well, and I had decided that day to see how active I could be. But most of all, I had decided to pursue joy and enjoy life. For so long my symptoms kept me from truly pursuing a freedom that I wanted in life. I lived in fear of the next relapse. I limited myself, particularly with regards to personal joy (ironic since my last name is joy). So it was joy that was my main motivation—not only for my day, but for getting well with the program. The next day I was tired, but not fatigued and nowhere near collapse. That was when I knew for sure that I was well. I was able to do something intensely physical and something intensely emotional (I was so nervous at the open mic!) and leave the experience feeling calm, happy, and focused on what I thought of myself, not what others thought of me. I didn’t have an ounce of self-criticism. I also didn’t have an ounce of the “prove myself” ambition that had been a part of my life for so long. I didn’t feel an adrenaline rush. But I did feel so much joy. I was deeply satisfied. I felt not only “good enough” but “great!”—meaning I felt contented. I couldn’t stop smiling. I still am learning so much. The program has given me a way to work on myself, my well being, my inner and outer happiness, and to build a good life. I am still doing the webinar, but I find myself these days watching the recording since I am pursuing more joy by going to drawing group during the time it is on live. The recording is just as helpful, as I can pause and write down notes and thoughts as I go, and take more time and even deepen my experience with the information. Thank you, Ashok. This program is truly miraculous, and a gift to all of us. I am so grateful that you pursued your own wellness and also took the step of sharing what you found with the world. To all the retrainers—thank you for being a part of my well being. If you are still on the road to wellness, believe in yourself, believe in the tools. Dig deep, it’s worth it. You can do it. I have been suffering from CFS for the past 15 years. Over that time I have tried every known treatment I could find to assist in recovery. Nothing seemed to work. I was convinced I had a food intolerance to amines, Salicylates, etc. and changed my diet dramatically until there was almost nothing to eat and yet the symptoms continued. What impressed me about Ashok was he was focused on the cause of the problem and offered a program to cure to the symptoms.He sent me the first 2 sessions of the program to view online and it made sense to me. The cause had nothing to do with diet, but rather the over stimulation of the ‘Amygdala’, which controls the fear response in our subconscious mind. I changed my diet immediately and found no worsening of my condition. (This really helped out at Christmas time.) I ordered the program which is a series of DVD’s and manual of mind exercises to retrain the response of the subconscious mind to negative thoughts and feelings. The costs of the program was about $200 and I received the package in the week prior to Christmas. It was slow to start, as I was anticipating a quick recovery (more to do with my personality), but after a month, my symptoms gradually weakened and I had my first full week out of bed. The past three weeks have been remarkable. I am now back working again, trying not to overdo it too much, but living a normal life. The symptoms are still there, but getting less and less every day. It has now been 3 weeks since I have had to lie down from exhaustion. The ‘foggy head’ is gone, but I still feel a little tired from time to time, hot flashes and irritable bowel, but not near the intensity of the past. Overwhelming fatigue, at all times. A feeling of being “distant” from everything in the world, as if I was in a dream and nothing was real. Strong depression and anxiety, and a feeling of just not caring about anything anymore (friends, obligations, etc.). Insomnia — so bad that at one point I had no sleeping routine, and I would be waking up and going to sleep at pretty much any time of the day. All symptoms worsening after eating (especially with particular foods). Occasionally, vomiting and diarrhoea after eating a particular food. I continued to get worse and worse until I got to a point where I was housebound most days (for about a year). At that time I just kind of accepted that I was unwell and there was nothing I could do about it (previously I’d been desperately looking for a cure, trying everything, to no avail), and after that I seemed to get a little bit better (but not a huge amount), and was able to get out a little bit more. Then at one point years later I got into reading again (although this was tough with the mental fog), and one day I stumbled upon a book called “Fear: The Friend of Exceptional People” by Geoff Thompson, and it piqued my interest since it was a book about overcoming fear, written by a guy who had been a nightclub doorman for several years. After following the advice of this book about overcoming particular fears, I found that actually, I started to feel a lot better on the whole, to my surprise. Then several months later I found the Gupta Programme (from an advert in an ME charity magazine) and it all clicked into place. At that point, I realised that the advice of the book and the Gupta Programme were fundamentally quite similar, except that the Gupta Programme, of course, was ME-specific. So, basically, I’d already been doing some amygdala retraining, but in a slightly different way. But now that I had started the Gupta Programme, I went on to improve a lot more, and eventually, I got to where I am today, which is where I feel that I’m almost cured of ME. I go out every single day now, and I actually have a life again. I’m still not back to work, but I’m looking to try it at some point soon. I still seem to have minor reactions to some foods, but they are also lessening, and for the first time since coming down with ME, I’m not really very bothered about them. I suppose what I’m doing now is just gradually expanding myself one step at a time. Just writing this now, I’m surprised how far I’ve come actually because the improvement has been so gradual that it’s been quite hard to notice it, as weird as that sounds! I guess it’s kind of like how I gradually got worse over time with ME, and before I knew it I was housebound — only, in reverse! It’s odd writing this really, thinking about how bad my symptoms used to be, because now I’ve just kind of got used to feeling better in general, and I expect *not* to feel awful if I go out, or do whatever. Anyway, I’m rambling on now! In conclusion, I cannot recommend the Gupta Programme highly enough. I shudder when I remember how bad I used to be, and to be honest it was hard for me to write this. Just thinking back over the past seven years makes me want to cry it was so bad, and so I really feel for the others. It’s almost something you never want to think about again. If anyone reading this is in that awful situation right now, I hope I’m able to convey to you that ME is not necessarily permanent. Dear Ashok, I began the retraining programme about 2 months ago. Within three weeks of receiving the package and working hard at the programme, I went on holiday! In fact, I left Australia, had a few days in Hong Kong and then flew on to the UK!. I had a three-week driving tour of England and Scotland which meant lots of driving and new and exciting adventures. During the four weeks away I had only one ‘dip’. I realized quickly that I had neglected doing the re-training as I’d forgotten I’d had M.E.! You gave me my life back. I was broken and you fixed me, I still use the program from time to time as a top up, but I am essentially 100% healed and I know it was your program that did it. When I got told I had a 5% chance of recovery from M.E. my life fell apart around my ears, then my family found a tiny article in a newspaper about the DVD program. I would have tried anything, and had tried everything else. Within 6 weeks I was well down the road to recovery. M.E. is now behind me and it is 100% thanks to the Gupta Programme. If you stick to it, you will get better! Of that I have no doubt. My name is Ursula, I am a German living in Malta, centre of the Mediterranean, and I was suffering from CFS for four years. I am purposely using the past tense here.I found Ashok’s advert on the immunesupport website last November, ordered the DVDs and started doing the retraining on 4th of January this year. So I’m just halfway through my six months period now. For me, the process has worked exactly the way Ashok announces on his website. I’m not yet 100% better, maybe 80%. But I don’t have the slightest doubt or worry the 100% will come. Ok, I was maybe in an easier position than others after 4 years of illness I hadn’t lost the memory of how life would be if I’m healthy, for instance. Also, I didn’t have many complicating secondary health issues.Up to now, what is required to recover from CFS by Ashok’s DVD programme, is having the guts for an own judgment, an own opinion on things, plus the ability to trust. For me, Ashok’s explanation is a breakthrough in the understanding of this kind of condition, and I see farther-reaching consequences of his discovery for other problems many people are facing these days. I’m leaving for a one-week bike trekking tour through Sicily, early tomorrow morning. To me, Ashok’s method is the answer to the ME/CFS and Fibromyalgia problem. It’s not just a therapy, this guy has made a discovery which reaches further. Only it will be a long way to have this accepted and fully explored, and made use of by the medical profession. I was diagnosed with ME and Fibromyalgia in 2002. At the time I was busy with a Counselling Practice as well as teaching Counselling, Clinical Theology and other courses; I was chair of a Division of the British Assoc for Counselling and Psychotherapy, and I was doing a degree with the Open University. Just before I became really ill, my sister died from cancer. Everything together caused my body to rebel and say ’enough!’ I had to give up all my work and my studies. I was in pain from the roots of my hair to my toenails, and when I woke in the morning I felt as though I had been run over by a truck, beat beaten up and had a dose of the flu’. I felt exhausted and my energy would suddenly disappear with the result that I would be drained physically, mentally and emotionally. I had difficulty sleeping even though I was tired out. My metabolism slowed down, the thyroid and adrenals were affected, and so on. I found it hard to think (which was especially hard as I was studying philosophy), my speech began to slur at times and I couldn’t find the words that I wanted to say. My writing deteriorated and sometimes became jumbled and my spelling ability vanished. It was horrible. The losses felt enormous.That is until last October when I began the Gupta Programme.Three days after starting the programme I went to Kew Gardens where I walked all day (on other trips to gardens or shows I had hired a buggy so that I could get around). I only started to feel tired in the late afternoon; I felt normal tiredness which was so different to the awful draining that I was accustomed to. Since then I have had been free from pain and have not needed to use a walking stick. Over the next few months, my sleep patterns improved and so did my brain fog and cognition.The first dip that I experienced after starting the programme was quite difficult to deal with until I realised that if I just began again it should work. It did. Stress is the fastest trigger of symptoms, but now I know that the effects will be minimal compared to the wipeout that I previously experienced. Now I have my life back. I have lots of energy, within the limitations of my age which, although I am 60, feels about 45 rather than the 95 years that I felt before. I keep rejoicing in the very noticeable change in my body, mind and emotions. Even my eyes have improved! The programme is simple. I still do it when I need to, and I keep up with meditation and relaxation. I recognise when the stress response centre is overreacting or likely to kick out the chemicals or signals that caused symptoms. The advantage of the Gupta Programme is that I have it as a permanent resource to turn to when I need it. It has been a miracle for me. My name is Jyoti and I am a 34-year-old yoga teacher from Winchester, Hampshire. I wanted to convey what a relief it is, at last, to have found a cure to CFS. I have had symptoms of chronic tiredness, blood sugar problems leading to dizziness, nausea and mood swings as well as general body aches and pains and IBS from the age of 16 (that’s now 18 years ago) when I contracted glandular fever during a very stressful period in my family life. I struggled for years with these symptoms, and would visit 5 different GPs during this time who all prescribed anti-depressants which did nothing to help me. I have a routine where first thing in the morning I wake, put my earphones on and I listen to the Gupta Prog cd thru a walkman. I find doing this starts the day on a positive note and keeps my mind focused. Last thing at night when the house is quiet, the walkman is put into use again – I can’t tell you how much this has affected my sleep patterns. For the first time in many years, I’m actually sleeping all night, no waking in pain, no sleep disturbance. I wake in the morning feeling rested and ready for the day. The muscle pain has completely gone, thankfully. Leg pain was one of the daily problems for me that I found unbearable and to now be without it is just brilliant. This past week has been a telling week as we had a couple of family emergencies. I have to confess this knocked me sideways and I started to feel tired again. I have had to look after my mother after a hospital emergency for the past 7 days, I have cooked her meals twice a day, stayed with her during the day to make sure she was well. I found this manageable whereas 4 months ago this would really have been out of the question. It hasn’t been problem free tho, I found my heart racing a couple of times and had one panic attack – I’m not focussing too much on those incidents as I know they can be a normal reaction to finding out your mother has been rushed to hospital. As I type this I just realised my eyes have been much better, I haven’t had as many problems with light intolerance, blurred vision or my right eye twitching(this is one thing id be really embarrassed about, it made me feel so low in public when my eye constantly twitched when I got exhausted)I too suffered chemical intolerance as mentioned here, I can’t recall reacting to anything much in this past couple of months. In fact, I bought a harpic toilet block this week which hasn’t affected me at all. This would have had me clinging to my bed not so long ago. I used nail varnish remover recently which didn’t affect me, carpet cleaning mousse also gave no reaction. These are all chemicals which would most definitely have made me dizzy, foggy headed and generally ill. I’m also finding foods I had intolerances to are being introduced back into my diet with no bloating or bad reactions. My brain fog isn’t cured completely but I have been suffering less with it. I still have times where for the life of me I cannot get my words out but for the most part, it is much improved. I felt pretty spaced out for a couple of days last week but on the whole, the fog has continued to lift a little more each week. All in all, I don’t feel ill anymore. I do still have ME but it isn’t something I think about. It used to hit me in the face every waking moment with the long list of symptoms I suffered – now I often completely forget about it because there are only symptoms of tiredness at the end of the day – which to be fair is normal considering the amount of energy I’m using daily. There are many other examples I could share to validate that the Gupta Prog is working for me but it would take me a week. I don’t have any doubts about the Prog working for me – my life is amazing now compared to when I started this in May. What is important to remember is the fact the Gupta Prog is relatively new and saying `find me someone who has been cured` is maybe a touch premature. I will come back here in a while and give an update as others will no doubt do and hopefully, the updates in one year will be that we are all fit and well. I was healthy as a child and teenager. I never had any health problems at all until I reached the age of 23. In 2004 I had glandular fever and this resulted in me having CFS/ME. I could not understand what was going on. I was not at all accustomed to being ill! I had lived in a moldy flat and somewhere there must have been PCB as well (as they later discovered in my blood test results). I had just finished my MA at UCL (perfectionist / achiever personality type, work hard and play hard being the rule of law! Typical for CFS/ME sufferers as I later discovered thanks to Ashok!) and was looking for work and was rather stressed at the time as London is very expensive and it was hard to find a well-paying job, especially as I had studied archaeology and there are far more archaeologists than there are jobs for them sadly! Also my mother almost died from blood poisoning and my boyfriend at the time was unemployed and depressed so I was constantly worrying about them also. To make matters worse, an orthodontist made a grave mistake and thus I developed TMJ with severe osteoarthritis in both jaw joints on top of the other problems common in CFS/ME like food intolerances, nausea, tiredness, exhaustion, swollen glands and flu-like symptoms – I was also in severe facial pain all the time and had migranes and headaches due to the TMJ. I was housebound for many years and tried many treatments, most of which didn’t help or made me worse. I guess most people with CFS/ME have been there! I was distraught and desperate for any help or advice. In late 2008/early 2009 suddenly my luck changed and I not only came across a doctor who knows about CFS/ME (they are few and far between!) whom someone on a CFS/ME forum recommended to me but someone also recommended the Gupta programme to me as it had helped her during the 6 months that she had been doing it. a huge difference as I was passing out a lot before – the heart needs Vitamin D to work properly! I had tried many diets before but none had really made any difference, I had been having severe digestive problems for years at this point and my stomach was getting better all the time now! First seeing the doctor helped me and gave me a boost and better health. I then heard and started doing the Gupta programme a few months later and the exhaustion and tiredness already improved in the first week of me doing it! I was thrilled! It was like a fail had been lifted from my eyes and I could see the world clearly again – not like before through a mist of exhaustion where nothing had made much sense to me anymore! For many years I did not know what was happening to my body and finally I had the answer! I knew straight away that Ashok was so right about everything and devoured his DVD series and have been a huge fan since! I started feeling better immediately. I started doing the daily meditations and the stop stop stops – a few years later the accelerator which I also found really helpful and it has been firm favourite of mine since! I also started doing yoga after a while when I was finally well enough to give that a go! And slowly my health started to improve, I didn’t need to sleep as much anymore, I became more active and started walking more and more and slowly but surely grew stronger. I have adopted a lot of Ashoks advice into my daily routines and it still helps me! I went from being housebound and hardly able to walk and having no friends or social life to being able to walk 30 minutes a day with no problems, doing daily yoga and riding the exercise bike with no ill effects and still having strength left over! I was so grateful to Ashok and am still am grateful to this day! I always look forward to the e-mails and any new advice he is able to give me. Everything he says is so true and helpful! Ashok turned my life around and I have not looked back since! This programme was the best thing to ever happen to me and I have been recommending it to everyone I know who might benefit from it! not able to do before for many years because the CFS/ME was too bad – all thanks to Gupta! I don’t feel like I have CFS anymore on most days and if some slight symptoms do appear when there is a time of more stress I know what to do and they quickly disappear! I hope to recover further and have less pain symptoms now that I have a dentist who knows about TMJ who has helped me with a bite splint. I have become a new and dare I say it – better – person thanks to Ashok! I am a lot more relaxed, can cope with stress a lot better thanks to the Gupta programme and meditation and yoga! I never imagined myself to be doing yoga or meditation as I thought they sounded so boring and pointless and never understood why anyone would want to do them on purpose. How wrong I was, how much I had yet to learn about the health benefits related to doing these simple but effective meditation and yoga exercises! Ashok’s webinars have also been invaluable! I learned so much and am still learning thanks to him. His advice is so useful on a daily basis, learning how to deal with “annoying” people, negative thoughts both related to symptoms but also non-symptom thoughts – I never thought about this before, and just had these thoughts and went with them, not thinking that I could do something about them and that I do not have to believe everything that the amygdala tells me! We are all works in progress, but at least we are evolving and remember: “No matter how many mistakes you make or how slow your progress, you are still way ahead of everyone who isn’t trying!” (Quote by unknown). I can only recommend this programme to everyone, it is the best thing that has ever happened to me! Thank you, Ashok from the bottom of my heart! I’d been ill a few years – a couple years mostly bedbound; a few years mostly housebound. At my brain’s lowest point I couldn’t read or understand people talking to me – word salad. My illness had a gradual onset, over about 4 months, at a time of extreme ongoing stress. It was triggered by mercury poisoning, though that wasn’t discovered for several years. I’ve since had the mercury taken out of my teeth (the source) and chelated from my system. That improved my cognitive function by about half and was improving my body up to ~30% function. I ran into trouble with the chelation eventually and wound up back in bed. It’s been amazing. I no longer need the riding carts in the stores. I don’t need my cane – which converts to a seat. (I can stand up!!!) I can think. I can cook (badly, since I’m out of practice, but that will change). I’ve been going to the local senior center for 2 weeks, riding the stationary bike there, and have joined a “stretch & strengthen” class there. On days I don’t bike, I’m walking – a little over a mile now. No recovery time. ! I’ve gotten over the shock of this new world I’m suddenly living in, but still feel strange parking deliberately far away from wherever I’m going – and leaving my cane in the car. I put off trying his meditations for a while; was seeing radical shifts in my function before I ever did that. I like the meditation and am doing it, but do not credit it with the improvements I’m seeing. 6 weeks ago I was at ~40% function; today I’d guess it’s ~85%. And rising. Essentially, I no longer have CFS. Now I’m just a fat middle-aged lady who’s way out of shape. But not for long. I believe this may be at the core of many auto-immune illnesses. The amygdala speaks directly to the hypothalamus, which controls the autonomic nervous system. We know the HPA axis is on tilt, and that the autonomic nervous system is bollixed. – May – husband retired. – June – sailing in Turkey with friends! I suffered from chronic pain for over 27 years trying everything both orthodox and complementary medicine to no avail. I was diagnosed with chronic Myofascial Pain Syndrome (a localised form of Fibromyalgia) which had completely taken over my life. I felt very depressed, anxious and unable to plan anything with friends and family. I just lived from one appointment to another in the hope that someone would understand and I could get some relief. My main symptoms were terrible spasms in my head which were more or less there all the time. I was unable to concentrate on anything and slept very badly which added to the ongoing pain and discomfort. To this day I don’t know how I managed to hold down full-time work in a very stressful job because some days I just felt so awful I wanted to die. Nobody could understand because I looked ok and as the medical profession couldn’t help me I was expected to be able to cope like everyone else. It was all just a nightmare that I lived through for years and many a time I was accused of ‘not pulling my weight’ by my work colleagues. Little did they know the supreme effort I was having to make just to get myself there! I did have to be off sick at times but I never received any support or understanding and I’m sure they thought I was just a malingerer. I used to be so envious of someone with a bad cold because I knew that at least they would get better whereas my illness was endless. 21 years after contracting the condition I resigned from my employment being unable to cope with the constant pain and pressure. 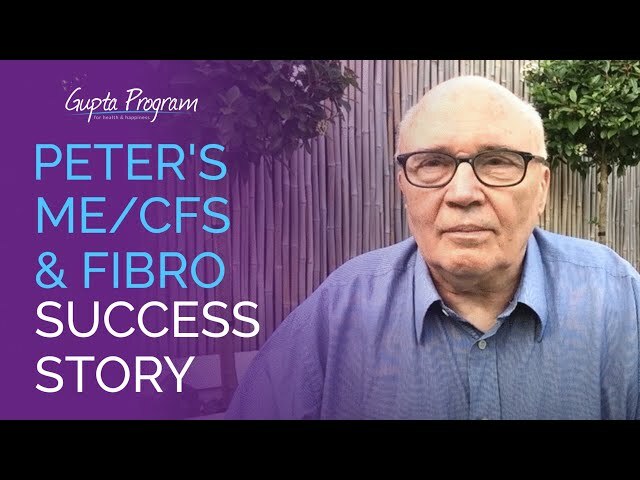 Eventually a few years ago I heard about a Fibromyalgia/ME Contact Group and last year I found out about the Gupta Programme through another person suffering from Fibromyalgia and CFS. She was so enthusiastic about it I decided to give it a try. I knew it meant a six-month commitment but I was so desperate I was ready to try anything. The Programme was really easy to follow and it almost immediately made a lot of sense to me as I could really relate to what Ashok Gupta was saying about the amygdala. I realised then that my amygdala must have been on constant alert for years and was just waiting to be ‘switched off”. Within a few weeks of following the Programme I started to feel different and much better within myself. I began to understand that without retraining the symptoms become totally self-perpetuating and so I gradually lost the awful fear associated with my Illness. I now incorporate meditation and breathing into my daily routine which makes me feel so much calmer and able to cope. If at any time I do feel slight symptoms I don’t panic because I know that I have all the tools at my disposal to deal with them. I feel so much better in every way and just know I am well on my way to a full recovery. I can’t recommend the Gupta Programme highly enough. It was the best money I have ever spent (I think I must have spent thousands over the years trying to get rid of the pain!) and my life is now completely different. It really is worth giving it a try – after all Ashok offers to refund your money if you don’t feel a difference in six months. What have you got to lose! 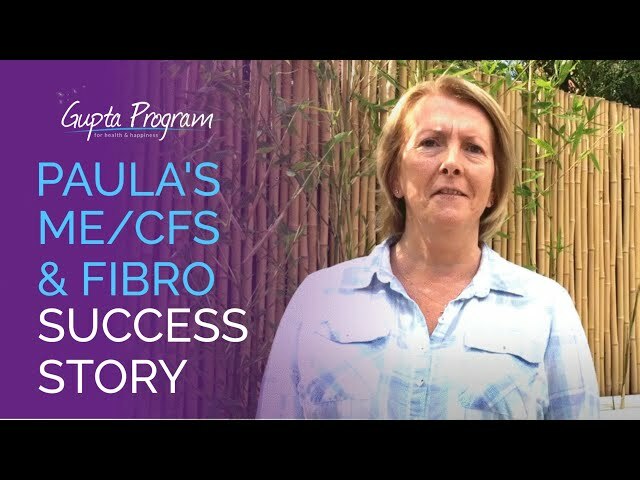 “I had both CFS and Fibromyalgia – diagnosed in 1995 when I was in my early twenties after glandular fever, and although I’d had several periods of remission, in 2012 I suffered another debilitating relapse. The DVD’s and the theory behind, the understanding, has helped immeasurably. Changing diet – took me too long to take your advice but the changes flew when I did! Also, your daily meditation has worked. I have so much more energy, hoping to go back to work at some point. Not something I could have achieved previously. I was diagnosed with ME and Fibromyalgia. At the time I was busy with a Counselling Practice as well as teaching Counselling, Clinical Theology and other courses; I was chair of a Division of the British Assoc for Counselling and Psychotherapy, and I was doing a degree with the Open University. Just before I became really ill, my sister died from cancer. Everything together caused my body to rebel and say ’enough!’ I had to give up all my work and my studies. My health became challenged in 1993 while I was remodelling my house. I had also experienced a number of highly stressful events preceding the remodel. I developed flu symptoms and was quite ill. The symptoms lasted six weeks, and then, six months later, I became ill again with the same symptoms. This time, I did not get well again. I began the long and painful journey of dealing with multiple chemical sensitivity and associated disorders. I was 52 years old at the time and began the odyssey of searching for who could adequately diagnose and treat me. I followed the treatment plan of each of the 22 doctors I consulted over the first 6½ years, but instead of recovering, my health deteriorated more. I was given many different diagnoses, but no one in the health community seemed to know what I was suffering from. Some doctors thought I was malingering or that I had a psychiatric disorder. I was prescribed antidepressants that made me violently ill; one antidepressant, in particular, made me suicidal. But I was too weak and sick to even take my life. At my worst, I was jaundiced, had bursts of sobbing out loud for no reason, contemplated suicide, had pain throughout my body, was highly sensitive to noxious smells, had burning skin with rashes, had cataracts, shuffled when I walked, had disabling fatigue, uncontrolled explosive diarrhea (sometimes in public), and was seriously cognitively impaired. I was so cognitively impaired that I could not even tell time. I was unable to schedule an appointment. I would get lost traveling only two blocks away. A psychological examination of my executive function showed that I was severely impaired. I was relieved because I sincerely thought I had Alzheimer’s disease. I was fortunate enough to find a doctor who saved my life. I improved, but I did not get well. My primary diagnoses were environmental illness or multiple chemical sensitivity, chronic fatigue syndrome, fibromyalgia, Lyme disease, IBS, malabsorption, food sensitivities, and toxic encephalopathy. Shortly thereafter I was diagnosed with breast cancer as well. Although I was very ill, I always believed there would be a cure me for me. I thought it would be some type of medication or medical protocol. I hoped that multiple chemical sensitivity would eventually be recognized as a legitimate illness. During those early years, most of my close friends lost touch with me. I felt very isolated. A young woman who was my best friend, and my lifeline when I was going through intensive treatment, took her life. I do think that was my lowest point. I was homebound for three and a half years to avoid exposures. Fortunately, I had my cat Pete and my husband Fraser. Fraser worked full time, did all the shopping and cooking, and cared for me. He gave me antigen injections (three full syringes daily for nine years) and about 200 nutritional IVs, along with agents to help me detoxify. My refrigerator looked like a clinic with vials and IV bottles. I had a very large oxygen tank in my living room. We were advised to put a tile floor in our bedroom, where I only had a bed and a glass and metal table. All of the clothes were removed from the closets, and there were no curtains. I had become hyper sensitive to just about everything in my environment, even cotton, so I slept on silk sheets that felt like a parachute, and all of the covers would slide off the bed. Life was extremely challenging. I was frightened, hopeless, and isolated. I was a psychotherapist with a thriving practice. I was attractive and highly respected in my community. I went from being physically attractive, intelligent, successful, and valued to being a struggling, confused, fragile, and vulnerable woman. Five years after my initial cancer diagnosis, I developed breast cancer again in the same breast and had a radical mastectomy. In addition to two surgeries with radiation for breast cancer, I also had an emergency appendectomy. My gall bladder removed as well. I had cataract surgery and became highly reactive to the lens implant. I also had a partial knee replacement that was a failure and had to have it replaced. I had been a psychotherapist and had some very challenging cases that certainly added to my chronic stress level. I thought of what I was experiencing as compassion fatigue. After ten or eleven years of treatment for chemical sensitivity, I thought I could practice again treating people with MCS via the telephone. My health immediately began to deteriorate, but I did not make the connection that it was the stress of treating people with the same illness as me that was causing my health to deteriorate. Later I got a call from one of the people I had treated, who had been far more ill than me. He reported he had gotten 90% better by using neural brain retraining. So at age 73, I began the Gupta Program. I dove right into it and was totally committed. I knew if my friend could get well that I, too, could get well. I had been down many blind alleys finding a cure, so I talked it over with my nutritionist, and he said, “Go for it! It does not involve a shot or a supplement. You have nothing to lose. Besides it is very inexpensive.” He was right; I had spent about $350,000 out-of-pocket on my health at this point. I began the program with full faith in its efficacy. I immediately liked Ashok Gupta and readily related to his gentle nature and the wisdom of his program. It made sense to me. I began by using food to do the Seven Step Technique and actually began the process by actually holding a piece of bread to desensitize. As I held the bread, I let all of my fear of reacting to the gluten surface, and then said, “Stop, stop, stop” and continued with the rest of the steps. Then the following day, I actually put a piece of bread in my mouth. In three and a half weeks I was eating foods with gluten, dairy, shellfish, onions, garlic. In about six months, I was eating everything. I felt so liberated. I recall going to a restaurant and ordering a hamburger and swooning over it. I was swooning like Sally in the “When Harry Met Sally” restaurant scene with Billy Crystal. Every morsel confirmed that I was well and could eat whatever I wanted. I also used the same technique with fragrances and found that I was no longer reactive to fragrances and did not fear reacting. I recall being in an elevator with a man with cologne, and instead of closing my nostrils and grabbing my mask from my purse, I just deeply breathed it in. I liked the way it smelled! I now can go anywhere I want now. I can do anything I want and eat anything I want. I consider myself well. I have had dips, one of which was after I had knee replacement surgery. The surgeon did not follow my instructions about what anesthesia to use, and I had a reaction. I also reacted to the tape that was used to close the incision. I am certain that my fear and anger at feeling helpless contributed to the dip. So I now often use the Acceptance and Surrender Meditation. I know that the most important time to do the Gupta techniques (Seven Step Technique, Soften and Flow Meditation, and the Accelerator Technique) is during a dip. Of course, I also had the most resistance then as well, but I just did it anyway and was able to come through it. I have travelled from Louisiana to New York City twice and was even able to attend the workshop with Ashok this past November (2016). I just wanted to meet him and express my gratitude. I also wanted a hug ;-). I consider myself about 95% well, and I wanted others to know that it is possible to be fully well again. My days are filled with activities that I enjoy, and if I am doing something that I don’t enjoy, I stop doing it. I catch negative thoughts, stop them, say a prayer for the person and change my focus to loving thoughts that comfort me. I continue to meditate twice daily and do the Seven Step technique daily. I have written about 70 vignettes, illustrated with photographs, about the happiest time in my life. I use one of these when I am doing Step 6 of the technique. My head is so full of memories of the happiest times in my life that there is no longer much room for negative or fearful thoughts. I have taken Ashok’s Coaching Webinar Series and have just completed my third series of 12 sessions and plan to take the next one. I always look forward to reinforcing this new healing paradigm. I listen to Ashok’s Meaning of Life Experiment meditations daily and watch the videos. I am committed to doing whatever it takes to be able enjoy every precious moment of my life. I am now 75 years old and I am living proof that you are not too old to do the Gupta Program. I am also living proof that the length of time that you’ve been ill does not prohibit your recovery. I am also living proof that how long you’ve been ill is of no consequence to recovering fully. I am not willing to waste one moment of my precious life. I am so very grateful to Ashok Gupta for developing a program that has given me my life back and made me well. I am filled with gratitude. Having been seriously chronically ill for 22 years, I have made a commitment not to waste one precious moment of my life by fretting, having fear about reacting, slipping into negativity, having regret about the past or fear of the future. I will live in the joy of the present moment. I have used the first version of the technique with the poster for about a month. And it was a great process to learn about the negative thoughts that were there and working on those. But I remember feeling a bit unsettled about it. For me personally, I remember getting extra enthusiastic when I learned about the Accelerator. I started working on the thoughts and feelings that were there still. At that time it was: fear of getting reactions to packages that were delivered (and newspaper smells, and sorting laundry before washing); looking in the mirror and worrying about red bits in my face (what have I done that caused this? ); I cannot concentrate on work with all this perfume around me. Positive Affirmations I used are: I can focus well. These smells are okay. I am calm and accept the smells around me and on me. I can take it. The main positive Affirmation I use when doing the short version of the technique is: ” I can take it “. I now mainly use the Accelerator to prepare for new situations: for instance, when very perfumy visitors come or when I need to go to a place where I know I will be close to lots of people with perfume. I am currently focusing on the concept of studying/working and concentrating in a room full of smells because this will happen in a month when I start with a new professional course ( I only do some volunteer work at the moment). I train myself on the thought of being relaxed and being able to focus on work in a room with other people during the visualization exercise every morning (exercise 2 of Disc 5). The meditation exercises I have been using every morning since I learned them. I find these really help to start the day in a relaxed way. I am able to read newspapers without getting annoyed about the smell of the ink ( I just don’t seem to smell it that much anymore). I take packages that are delivered without worries. Since about two weeks I use soap in public places ( I had not done that for about three years ). And last weekend I actually did not bring my own neutral soap anymore when I went into town, and I washed my hands at a public toilet with their soap. And it was okay. I will probably not start using that soap in my own home, because I like the more non-chemical stuff also because it’s better for our environment, but the point is, that I am able to use the other stuff when I come across it. And I am able to be okay with the other people’s perfumes ( even when they leave a bit on my face after they kissed me). I have seen that a core belief of people with MCS is “the world is a hostile place”. I have heard this belief often stated in various words in MCS posts on other forums. I believe this pattern of thinking is what engenders an exaggerated amygdala reaction to environmental chemicals. Toxins in the environment confirm this belief and the reaction builds as in the other stress illnesses. This is the pattern I work on the most. Personally, I cannot separate MCS from food intolerances. I have both and they seem fundamentally related to me. After studying the program I begin to suspect that lively family arguments during dinner when I was a child may have contributed to food sensitivities. I have done nothing to attempt to desensitize myself systematically from chemicals and foods. My experience is that working the program is causing the sensitivities to diminish on their own. I push myself into eating more and more foods as I improve and back off from time to time when I pushed too far. This seems to work. The chemical sensitivities are diminishing on their own. I spilt gasoline yesterday and was not ill from it even without a mask. As is to be expected times of stress result in more symptoms. Many MCS patients are concerned with ‘ letting go’ of their knowledge that chemicals are ‘bad’ for us when they retrain their emotional response to their hypersensitive reaction to chemicals. I used to remind myself that intellectually I was knowledgeable enough to know that the average amount of chemical out in the world is generally not harmful. Yes, large amounts of chemical from autos in the shop being lacquered or airplanes spraying pesticides… are not reasonable levels of chemicals to choose to be around HOWEVER, the average floor cleaner, air freshener in the bathroom, the perfume on the person nearby…all are reasonable levels of chemicals to be around. I had to intellectually override my MCS reactions using the techniques but also to satisfy my former learned behaviour that ALL chemicals needed to be avoided and I was not betraying my body to abandon my old beliefs as well as to retrain out of my body’s reactions. I retrained around sensitivities to electro-magnetic things. I reminded myself from my training as a REIKI practitioner that electrical fields move through our bodies in order to ground out into the earth. The reason I was feeling so ill around lectrics was due NOT to any inherent danger from computers or electric trains, but from my own body’s electrical field which was in a state of disarray from my ‘electrical’ brain connections being hyperactive and stuck in excess mode. I reminded myself that retraining would bring order to my own body’s electrics which would allow for external electrical frequencies to move smoothly through my body and ground out efficiently. Also, knowing that a non-peaceful emotional brain would cause extremes in emotions…and hypersensitive emotions can represent stuck energy. I also encouraged myself to NOT make significant changes to my ‘world’ whilst retraining. So for an MCS patient…I think it is important to maintain a simplistic environment from which explorations into the outside world can be accomplished and confidence in the retraining, in the beginning, is easier if you know that you have your clean space to go home to. As the retraining takes hold and wellness comes, more and more outer experiences bring confidence that the clean space can now be modified to include electronics, things with odors, etc. I believe the confidence whilst retraining is a gradual growth and I believe for the MCS patient, trust in that growth is best accompanied by a steady relinquish of the ‘clean’ bubble space…I believe the immediate introduction of the ‘normal’ world is too jarring for the recovery/retraining process. I believe I heard you mention not to change much in the beginning of the retraining process. I think this is very wise, especially for the MCS patient. I also think that unlike the ME and CFIDS patient who looks at their body for signs of distress from activity…the MCS patient looks at the world as a potential source for severe detriment to be manifested by bodily reactions. I constantly used the Soften and Flow to loosen up my body out in the world and used my knowledge that my liver enzymes have almost always shown to be normal, so I chose to trust my detox capabilities were indeed NOT compromised, despite how my body felt and that my reactions were due to my brain…I had to really rethink how I had learned to perceive the outside world as the danger and to trust that my body was manifesting faulty wiring was the true source of my reactions. I think the key to the MCS patient doing well with retraining is to learn, retrain and to do the Accelerator technique around one’s learned perceptions, which have been reinforced by one’s bodily symptoms, that the world is indeed a safe place to thrive. The trending mindset supported by the media can at times echo that chemicals are not safe and electronics cause brain tumors, etc…This seems to be the factor that works against the MCS patient in retraining since there are so many voices supporting the perception that the above mentioned are truly ‘bad’ for your health. The MCS patient has to really overcome what the media enforces that the chemical world is dangerous and unsafe. The platform from which wellness can be created with the MCS patient is to rely on their own discernment that extremities of almost anything are not necessarily good HOWEVER, in moderation…most things in the world are truly safe and our bodies can handle them…So the MCS patient finds wellness in trusting that their knowledge in staying out of extremes and dwelling in moderation is a trustworthy concept from which to incorporate successful brain retraining. On a personal note: as I was recovering, I had an occasion to have my new understanding reinforced. I was setting up an air conditioner and the old patterns in my brain were telling me I might have a problem with the plastic off-gassing from the warmed wires in the unit’s motor. As I ran the air conditioner I began to smell something and I ‘knew’ it was the warm plastic and that I would eventually not be able to use the unit. I went into my kitchen to retrieve a phone directory to call the local hardware store for tools with which I would take the bloody thing apart and try to make accommodations to it… I noticed when I entered the kitchen that there was a glass sauce pot in the stove that I forgot about and all the water had boiled off… The hot electrical stove burner was creating an over-heat smell from the GLASS pot… Not a bit of plastic involved… BUT my body went into the very same reaction that I used to experience when I was severely sensitive to any PLASTIC! It was SO POWERFUL for me to witness my body having a clear, recognizable reaction to specifically plastic when in fact it was a generic “smell” and my FOCUS on the new air conditioner that had convinced my body to have a full-blown plastic reaction… And immediately when I realised my perceptional error… and with a bit of self-laughter… My reaction immediately resolved! Your program has been miraculous for me. It has completely cured me of MCS and greatly improved my life overall. I ordered the program and started on January 4. I focused on it intensively for three months. By that time I was 85-90 percent cured. For Easter weekend I flew to Maine, USA to see my mother. I was able to be in airports, sit in planes, stay in a hotel room (although a little problematic) and rent a car. I was crying in the airport. In April I started a new job which requires being in many locations. I do it without a problem. July 4 was my six-month target date and by then I had almost forgotten about MCS. I hosted a family reunion and we went into restaurants and stores and other public places. On really has to commit to doing it non-stop and going to the dark side. So often I would say, oh this session is not for me, I have this covered. Then I would do it and be blown away. The results, though, are transcendental- cure, oneness with God on a daily basis, improved relationships, and a new perspective on life. The non-symptom patterns are of course the key. I have been proselytizing, referring your program to everyone who has any kind of deep issue because I think it can help. I am not perfect, of course. I backslid and right now need to get back to the program because old career/achievement patterns are re-emerging. One needs to remain vigilant. The MCS, though, is gone. It is over – I am done with it. I work for a cleaner world but smell the toxic smells and tell myself that for me they are the smell of freedom. would help my Amygdala to realize that perfume is not a danger to my body. I have done it in relaxed situations (it’s not possible in shops etc, where it’s impossible to relax and feel comfortable and concentrated for 20 minutes – and the fear of being driven away in a straitjacket. I have done it at home with a piece of perfumed cloth, that I placed in front of me, and in the train, where I could sit with closed eyes and my MP3 player with the Soften and Flow whilst being exposed to the perfume from the other passengers (they would think that I was enjoying some nice music I had to smile at). The last 6 weeks I have focused on this ” homemade Soften & Flow with exposure ” and I’m now able to confront the worst fabric softener in town this way. Today I would like to write to you to say that my life is a further example which shows that your programme works against MCS. I was fortunate enough to come across your programme after less than 2 years of suffering from MCS (during which I went through times of sleeping in the forest, of withdrawing from social life for fear of things like perfumes, odours from carpets or other indoor chemicals, exhaust fumes, etc. and I was on sick-leave for almost 12 months). Before I learned about your hypothesis and re-training methods, I had seen videos on Youtube with testimonies of people who said that they had been healed from MCS through certain re-training techniques, but they did not make clear references to who or what had healed them. I had read a lot about brain research and I was treated by a physician for stress symptoms for quite some time before a friend of mine urged me to look at the website of a Swiss MCS support group. There I found a link to a discussion forum with a post from someone who explained eloquently how the Gupta Programme had helped him and why he thought that the criticism of the programme mainly came from people who had never tried it. I followed the link from that post to your website, read your explanations there, and over the following few days watched some of your Youtube videos. As everything you said sounded ever so plausible to me and fit in with other things I had read and heard before, I ordered your DVD set. And what can I say, I did not even have to wait until I got to the exercises which you recommend. Once I had understood what MCS is all about and where it comes from, I started getting better, and my over-sensitivity towards chemical smells started decreasing. I have started and will continue trying to share my positive experiences with others who are affected by MCS. But so far I have learned that this sharing is not often welcomed with arms open wide… Scepticism and sometimes downright aggressivity seem to be a widespread attitude – usually from people who only know your programme by hearsay. I think that I will soon also make another appointment with the doctor who offered me his (sound and non-conventional-medicine) stress treatment for several months and whom I have not seen in quite a while because I feel so much better. He treats patients with MCS and has a good approach, but at least until autumn of last year he was quite apparently not yet aware of the “missing link” which is provided by your programme. I would be glad if a lot of people with MCS (or CFS, or fibromyalgia, etc.) learned more about your hypothesis and if they were open enough to try this approach for themselves, even if everybody around them tells them that there is no cure for their problem. And I will try to contribute my share in order to make this happen. I would like to thank you for your 30 day program (www.themeaningoflife.tv). I want you to know how much good you have done for me. I’m from the south of Belgium, I speak French but I have been living in Maine in the United States since 2001. First of all, the Meaning of Life has helped me overcome my state of deep anxiety after my son Francois had a subarachnoid hemorrhage in October 2014. Francois was 22 when this happened. Fortunately, he is doing very well now. But at that time, even though my son had survived? and had only mild impairments, I was in distress. I could not understand why. I started to see a psychologist in December 2014 and I discovered your program in February 2015. The Meaning of Life Experiment gave me the tools to move forward and accelerate the work I was doing with my psychologist. I’m doing so well now. I’m much happier and I have also found my life purpose. I didn’t really change what I’m was doing but I have recognized and value the importance of my different roles. I have also changed my mindset of how I approach my work. First, I’m a devoted mother of 3 young men, Francois 24, Maxim 19 and Sebastian 16. Secondly, I teach French over the phone and I value my relationship with my students and I care deeply for them. Thirdly, I’m helping my husband with his nonprofit organisation, which is helping people in need around the world to access healthy food by helping to fund food gardens. Secondly, The Meaning of Life and the Gupta Programme have helped me with Hashimoto disease. I was diagnosed with Hashimoto in 2013. I started to take Ltyroxine but after a year my symptoms were worse than before and I had even more problems. In June 2014, I stopped my medication and I became gluten-free. I also consulted a functional medicine doctor who helped me to take different complements to restore my gut and support my thyroid gland. Since then, I have been doing blood tests regularly to check on the evolution of the disease. In spring 2015, I still had a lot of symptoms, fatigue, cramps in my legs, anxiety,… and this is when I started the Meaning of Life Experiment. I still remember the first time I did a meditation, right way it calmed me and helped my muscles to relax. The stop, stop, stop strategy helped me to deal with my physical symptoms (cramps in my legs) and my negative thinking (negative scenarios). 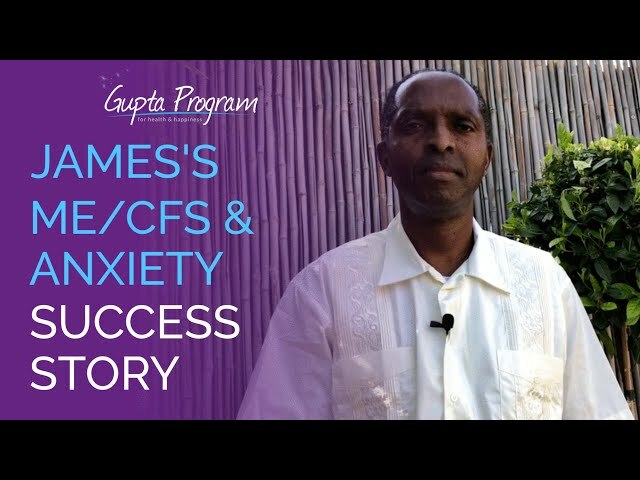 The Gupta Programme helped me to understand how my brain works and the importance of reducing my stress level. Today, my blood tests? are great, I don’t feel sick anymore! My name is Jyoti and I am a 34-year-old yoga teacher from Winchester, Hampshire. I wanted to convey what a relief it is at last to have found a cure to cfs. I have had symptoms of chronic tiredness, blood sugar problems leading to dizziness, nausea and mood swings as well as general body aches and pains and IBS from the age of 16 (that’s now 18 years ago) when I contracted glandular fever during a very stressful period in my family life. I struggled for years with these symptoms, and would visit 5 different GPs during this time who all prescribed anti-depressants which did nothing to help me.